After returning from Alaska in early September (more on this to follow!) the bags didn’t even unpack, and we were off again. 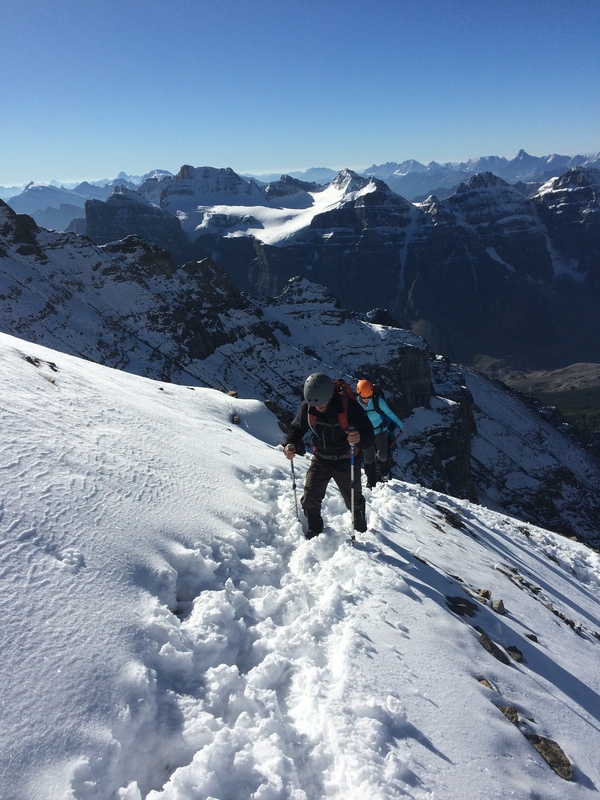 For the last two years summiting Mount Temple (Moraine Lake/Lake Louise, Alberta, Canada) had been on the top of my “to-do” adventure list, but seemed to evade us one way or another each time we started looking at it. We decided last minute, only two weeks before leaving for Alaska, that we would make a late season push 3 days after getting home from Alaska, for my adventure partner in crime, Ashley’s 30th birthday. The prime summit season for Temple is July – early August. Before and after your odds of encountering heavy snow and poor conditions. Even in this prime window there is never a guarantee of summiting due to conditions. But turns out, we could not have been rewarded any better for our late season efforts. 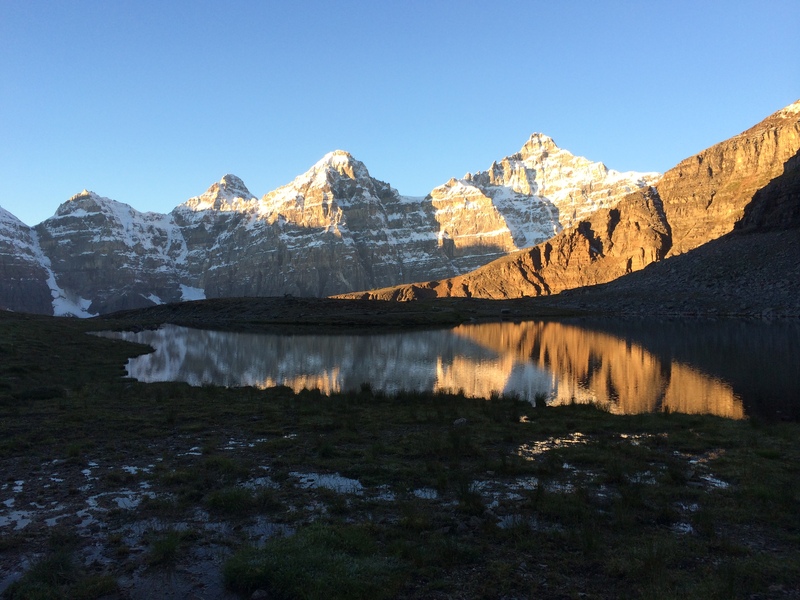 We slept in the car near Lake Louise to get a head start on the morning, opting for a 4:45am wake-up call for a 6:00am start, instead of the 2:00am wake up we would have needed if driving out from Calgary the morning of. This trip was my first real exposure to the Larch Valley/Sentinel Pass/Valley of Ten Peaks area, and mother nature brought her A-game! We had clear sky’s, and virtually no wind until about half way up the summit. We made Sentinel Pass early enough to catch the first sun hitting the peaks. Valley of Ten Peaks at first light. 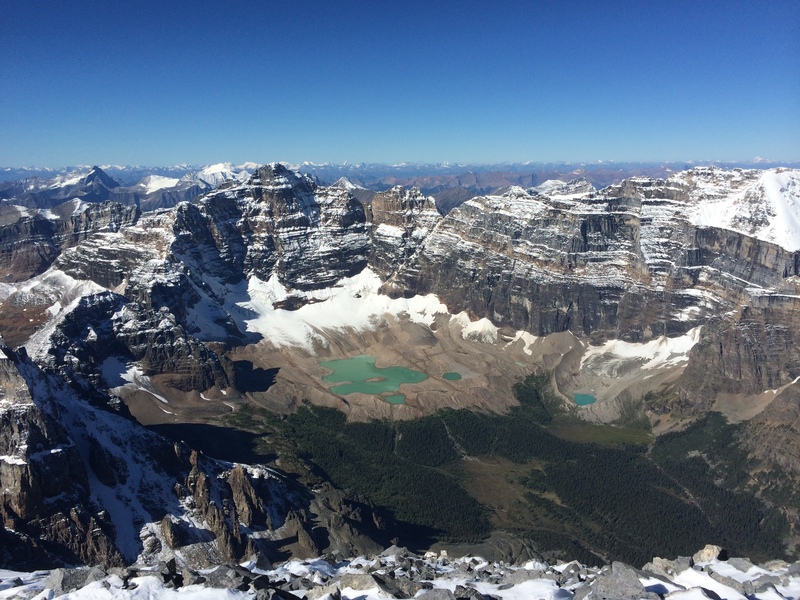 Valley of Ten Peaks from Mount Temple – Eiffel Peak, right. The trek up from the saddle – where the real fun begins – was a mix of ice-covered rock and scree, making for light stepping through the ascent, as it was already beginning to melt in the early hours. 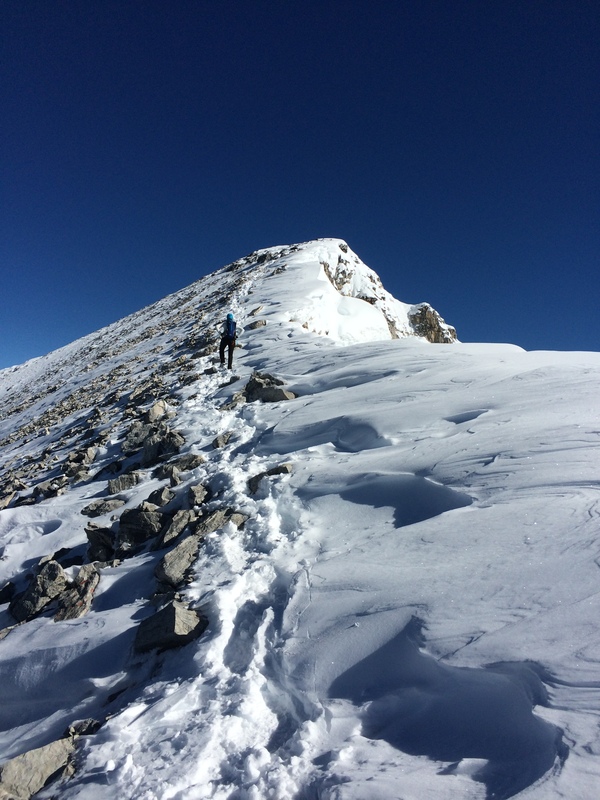 Two short (3m & 5m) climbs, roughly half way from the Saddle (Sentinel Pass) sent us into solid snow for the remainder of the trek. Thankfully it wasn’t as deep as it could have been, considering recent snowfall, though we were still in near knee-deep patches along the way. Rich Normand leading the way for the second half of our team. We had moved fast all morning and crushed our expected timeline by a few hours. The final stretch before the summit push was slow moving. The snow was getting deeper, wind blowing colder and stronger. Everyone was running low on steam by this point. 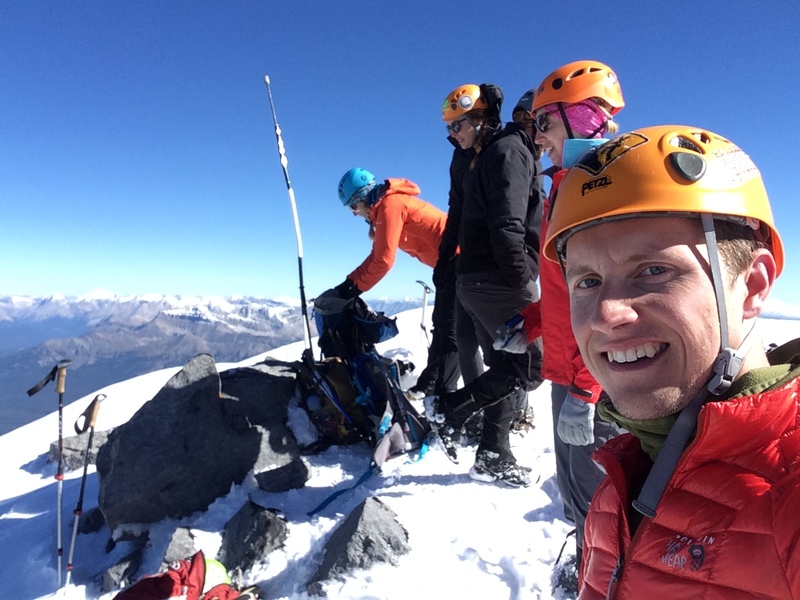 It was an unexplainable feeling moving up to the final push to the summit – a long, narrow, snow capped, ridge. 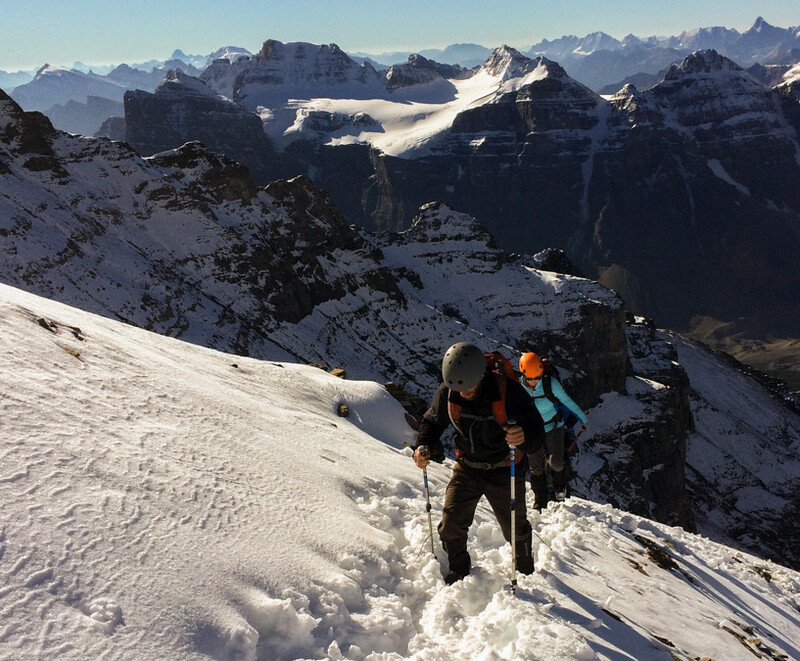 The view of the summit brought on a second wind that made the final stretch feel like nothing… Sort of. Ashley making the final push to the Summit. 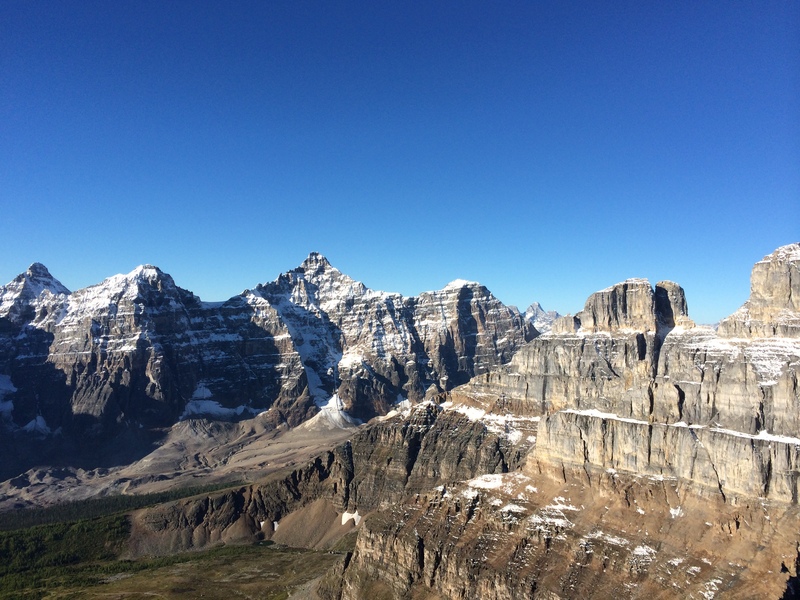 Mount Temple, Alberta. On that final push, Ashley moved up the ridge about 100 feet in front of me. This summit was especially exciting for her and I. We had first discussed the attempt two years ago, on my birthday, but a knee injury last summer put a lot on hold. Watching her come back and crush the ascent this year was an awesome feeling. We could not have asked for a better day, or a better team to make this happen. The conditions were impeccable and visibility of the Bow Valley was awesome. 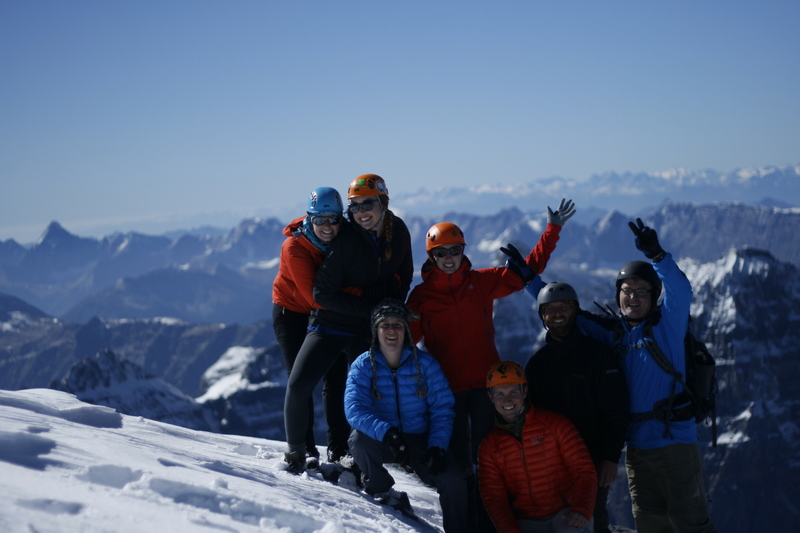 This was my first 11,000′ + summit – A first for most of us in the group, actually – and will certainly be far from my last. I’ve had many different adventure ideas run through my head over the years. Some of them completed, and many others may only ever stay as dreams, but this endeavor has opened those floodgates again, and I’ve got some pretty awesome new ideas, and a whole new bucket of motivation! Celebrating the summit of Mt. Temple at 11, 627 feet. Thanks Ash, Dee, Christina, Laura, Rich, and our unnamed new summit friend for the adventure. A View from Heaven, into Paradise Valley.